Adapter to connect VHF antenna cables to dAISy. AIS doesn't have to be expensive. With dAISy all you need to start tracking ships are a VHF antenna, a Windows, Mac, Linux or Android device, and a clear view of the sea. 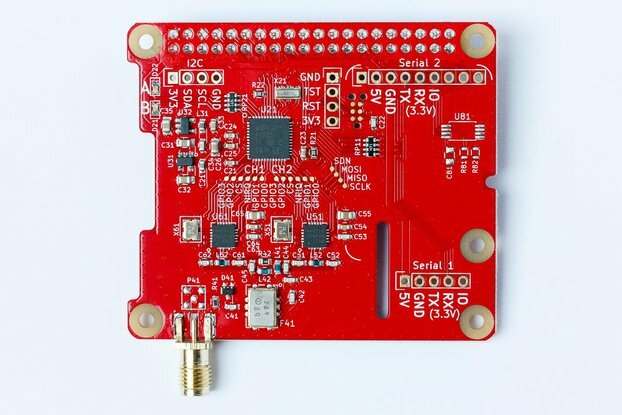 This true dual-channel marine AIS receiver works great with OpenCPN, OpenPlotter, Ship Plotter and any other software that accepts serial data input. 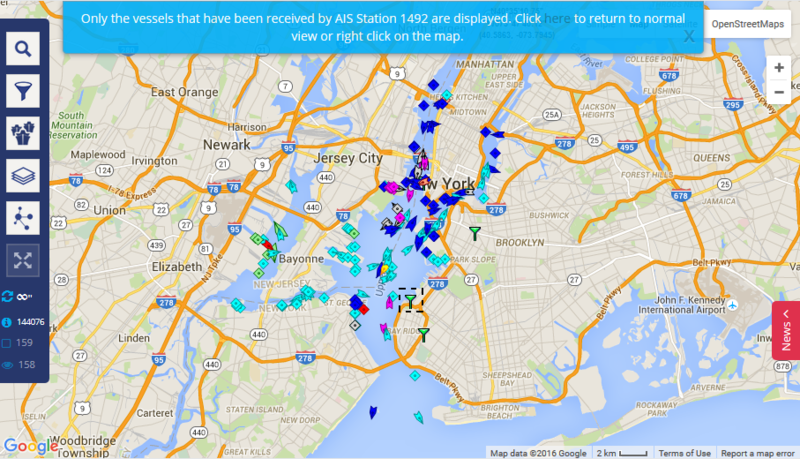 dAISy is also well suited for reporting local ship traffic to services like MarineTraffic. Thanks to its two-channel design, dAISy 2+ receives about 40% more messages than the cheaper single-channel dAISy. This improves acquisition time and update rate of AIS targets, while range is comparable for both models. No drivers required for Windows 10, Mac OS X and Linux (driver available for older versions of Windows). Supported by Boat Beacon, OpenCPN and SailGrib WR on Android devices with USB OTG. The dAISy 2+ AIS Receiver can directly talk to chart plotters and other marine electronics. In addition, the integrated DC/DC converter allows to power it from your boat's 12-36V power system, removing the need for a USB power source. dAISy was successfully tested with chart plotters (Garmin GpsMap 750s, Standard Horizon CP180i, Samyung N700), NMEA routers (vyacht) and RS-422 routers (Transas 4 port RS-422 to Ethernet). I expect it to also work with other devices that support NMEA 0183 or RS-422 input. OpenCPN, an open source chart plotter and navigation software, can be used with devices like dAISy to track ships on a map. 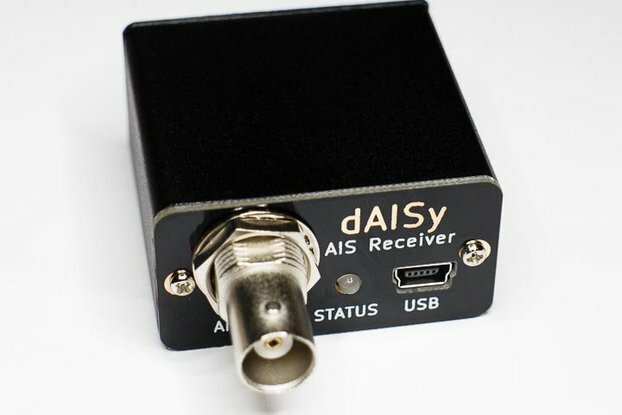 Any software running on a PC, Mac or small Linux computer that accepts AIS data from a serial input will work with dAISy. Several of our customers built chart plotters based on Raspberry Pi 2, OpenCPN and dAISy. A detailed write-up can be found here. A similar project based on the UDOO Neo single board computer can be found here. Disclaimer: WE DO NOT RECOMMEND to rely solely on dAISy for navigation and collision avoidance! dAISy is well suited to report nearby ship traffic to websites and services like MarineTraffic, FleetMon, AISHub or Pocket Mariner. A user of an early prototype of dAISy documented how to configure a Linux system like Raspberry Pi to report directly to MarineTraffic here. An alternative approach is to use Kplex. Kplex is a NMEA-0183 Multiplexer which allows to feed the AIS data stream to multiple targets, including services like MarineTraffic and AISHub. Kplex also allows you to setup a NMEA server to distribute AIS to other devices on your network, like for example via WiFi to a navigation app running on an iPad. MUPLEX for Linux and NMEA Router for Windows are a similar tools. For tinkerers, the serial data stream is available on a 0.1" header on the back of the unit. Advanced users can combine dAISy with a Bluetooth module to receive AIS on wireless devices, or connect a data logger like SparkFun OpenLog. In fact, the pin-out of the auxiliary serial port is compatible with the HC-05/06 Bluetooth modules and DT-06 TTL to WiFi modules commonly found on eBay, AliExpress and the like. Here are instructions for configuring the WiFi module. If UART serial communication is all you need, also take a look at our dAISy HAT, which can be run standalone without a Raspberry Pi. With our open source work, we pioneered a new category of AIS receivers designed around the SiLabs EZRadioPro single chip radio IC. This architecture is instrumental for the very low price, small form factor and low power consumption. The trade-offs are longer acquisition time, lower sensitivity and less range than traditional AIS receivers. Field tests with conventional dual-channel receivers (like SmartRadio SR162, advanSEA RX-100) showed that dAISy 2+ indeed has lower range and is slower to acquire targets. However dAISy 2+ clearly outperforms other low-cost receivers that we've tested (Quark-elec, MarineGadget). Our observation is, that with a good antenna dAISy is well suited to monitor local ship traffic. If you need maximum performance and are willing to pay for it, go with a receiver from the established brands. dAISy is professionally assembled in the USA. We offer a 12 month warranty on the product (excluding physical or water damage). Please contact us if dAISy prematurely fails or if you encounter any other technical issues. We ship with USPS First Class or Priority Mail. International delivery is very reliable, however tracking is only available for a few countries. Please contact us if you have special shipping requirements. We also offer international shipping with DHL for US$30 to US$120 depending on location. Please contact us for a quote if interested. Works fine with Raymarine eS MFD (Lighthouse only shows AIS connection when it gets a GPS lock however). DAISy2 plus unit arrived promptly and in good condition. it seems well designed and fabricated. The downloadable manual is well written and driver download was simple. setup on my computer semed straight forward. Product received but not yet test. Need More imprisonment about setting of this device with tablet, compute, mobile etc. Seller can provide a video tutorial for installation. It was shipped out of US with no problems and I was able to install it by myself following the instructions. Adrian Studer @wegmatt offer additional help and advice by email and answered promptly to few questions. I used dAISy 2+ during a 1700nm trips from Panama to Georgia (USA) and it proved helpful sailing through busy areas such as the entrance of the Panama Canal and the Straits of Florida. It was connected to the VHF antenna on top of my sailboat's mast (37ft) via an antenna splitter and during the sailing I was able to pick up AIS targets as far as 17nm. I was able to both operate the radio and receive AIS without any problem. I connected dAISy 2+ with an OTG cable to my Android tablet. While it worked good with certain applications (BoatBeacon) it did not showed up on OpenCPN but that was because of Android version issues on my OpenCPN app. I suggest to use a WiFi module that plugs in the dAISy to avoid such problems. I highly recommend this product because it's inexpensive, easy to install and it performs very well.
. Worked straight out of the box, picked up ships as far away as 16nm, using a telescopic emergency vhf antenna taped to the boathook, about 3m above the water, so I expect very good range when it is properly installed with a good antenna. I have experience with a comparable product from Adrian's competitor in this segment of the AIS market, and the operation of the product plus his rapid communication beats them hands down. Tested using usb on a laptop with a low grade VHF antenna and it worked flawlessly first time. Looking forward to wiring it into the NMEA Navnet when our boat is next alongside. I'm sorry to hear about your disappointment. I agree that 2 NM is below the expected performance. There are several reasons that could limit range, including the possibility of a defective unit. I will reach out to you by email to discuss further. I would just like to share my thoughts on your dAISy AIS receiver. I have now had some time to play with it and have found it to be very good. It was easy to set up, just follow the instructions and you can't go wrong. I also bought a WiFi transmitter from Ali Express for a few dollars which also works well. As I have no experience with other AIS receivers I can't compare its functionality but I have been using it with Open CPN and it works well on my laptop, android tablet and Samsung phone. It seems to acquire targets fastest on my phone. Thanks for a very nice product at an affordable price. Was easy to install and wire up. instructions were helpful. is working and showing targets clearly, have not used extensively as yet. will update after a long sailing voyage. shipping was wierd and long. i live in vancouver canada , went from redmond to seattle to los angeles . ??? then to vancouver. Excellent Value for money I have only had it installed for a few days and have found it works just as expected through an ariel splitter. The only area that I haven't tested properly yet is the bluetooth function as the module I purchased seperately appears to have pins in a differen't sequence to the output on the Daisy. I will investigate further when I get the time. In the meantime the hardwired outlets to computer and plotter are all I need and working well. Note, that serial pin connections are typically labelled from the perspective of the device. TX on dAISy denotes, that data is transmitted from this pin. RX on the Bluetooth module indicates, that it expects to receive data on that pin. Therefore RX/TX need to be crossed when connecting two devices, i.e. connect dAISy TX to Bluetooth RX, and dAISy RX to Bluetooth TX. I bought the daisy 2+ on a recommend from a friend who is very satisfied with his. my more techie friend additionally reported excellent guidance from Adrian on tech issues. Unfortunately I ended up not being able to use the device. I decided instead to install an AIS B transponder which Adrian does not carry. Adrian immediately responded, i returned the daisy to him and he refunded my money right away. you can feel comfortable doing business with Adrian. Good and easy to install! I bought this product in order to function as a stand-alone AIS receiver, by using Wifi and a tablet. I ordered a Wifi module as suggested in the documentation, which arrived a few days after the dAISy. Installation of the dAISy was very easy: slide in the Wifi module, power the module from the USB on board, connect a VHF antenna and ready! The biggest problem was finding an appropriate app on the tablet or iPad that could plot the data without using charts, in other words, as a sort of radar. On the tablet, I installed OpenCPN (without charts; free); it can show the position of your ship in the center of the screen and installation is very easy. On the iPad, I installed "AIS Radar" (€7,99), which appears to be the only app available for the iPad if you want to plot the data on a radar-like screen. Installation was easy and it functions well. Both tablets use their internal GPS (you have to enter that in the settings of the app). With the VHF antenna in the mast, I received AIS signals up to more than 24 km distance. With a VHF antenna at 3 m height, reception was up to about 12 miles, which I think is quite good! Overall, the value for money of this product is very good, even with shipping to Europe and taxes. Commercial products are about 3 times more expensive! Works perfect with Glomex RA 201 and Raymarine A50 Plotter. Communication to the plotter with simple two wire connection via NMEA 0183. Shipping to Germany was good. The package was helt at Customs in Frankfurt Airport for about 2 weeks, but i didn't had to pay any taxes or customs. Installed the dAISy 2 along with an antenna splitter on my older E80 chartplotter. Had to reprogram the baud rate on the dAISy 2. Works like a champ. Works without any problems on computer using USB connection. Also, I have tested it on Garmin GpsMap 421s, using NMEA connection - with success. I just wanted to correct one comment on my previous review. This unit DOES visually show CPA. I don't know why I missed this but I am very happy with this unit and would highly recommend it. Bought this to replace a device made in Uk that was enclosed in a cheesy thin plastic case that broke from the weight/pressure of antenna connection and shorted out. To be fair had I been aware of the thinness of the plastic I would have treated it like China. This device is encased in an aluminum housing that you could step on with no adverse effect. The best part is for $5 you can add a wireless card and have the functionality of a $300 unit! Those are all the pluses of this gem. My wish list would be to have the visual CPA that the English unit had as in a busy harbor visual information allows for quicker assessment of the big boys that are a danger to my punny craft. Great Product! Works Perfectly. Documentation Excellent. Can't say enough good things. Product works exactly as it should. 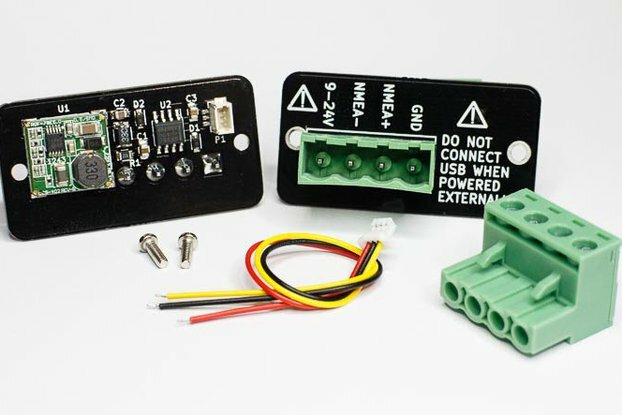 Fantastic inexpensive AIS receiver with lots of options... USB and NMEA power sources make it perfect for on board USB connection to a lap top... or.... directly as a NMEA 0183 input to a larger network. Adrian is available as needed and support was great to a couple of small questions I had. Prompt and Accurate support with great documentation. If you are thinking AIS reception at a great price... this product is for you. Tested in my home. Received signals from boats up to 25 Nm. Used a good VHF antenna. Very pleased with the product. Here in Norway there are lots of mountains, and I received signals from ships that were behind high mountains too. It was necessary to read the documentation several times, but otherwise all work as expected. Worked great straight out of the box. Receiver is sensitive enough to pick up coded messages from 92nm away (OK I've got a good antenna, but the unit still needs to be low noise to be able to pick out the digital messages). Windows 10 and OpenCPN worked without a hitch. One thing you might find is that if you use the item plugged into a multiplexer powered only from the PC you might run out of power - works great on its own USB port, with external power or if the multiplexer has external power. Note this is not a fault on the DaisY, just something you might come across. Shipping and enthusiasm from the suppliers was great. Product is excellent! Easy to install, it´s working perfectly. Adrian answered inmediately and clearly all the questions. The software drivers were too damn hard to set up!! I killed many hours over two days and it still does not sync with my Garmin 741xs. The 741 searches for it but does not find it. Yes, I do have the DT=06 WiFi moduale and the blue light works and the Daisy 2+ appears at the com port and the green lights flash at 5 seconds. The computer sees it but the 741 does not. I give up!! The 741 does sync with the computer. I'm sorry to hear about your struggles. Please don't hesitate to send me an email if you need help resolving your issue (contact@wegmatt.com). Keep in mind, that the chartplotter will only see the AIS Receiver if there are AIS targets around you. Otherwise the receiver will stay silent. I received the Daisy 2+, made a basic antenna (piece of wire abt 40 cm long ) conected to my tablet via OTG running OpenCPN and .....Thats all!! All the ships in Cadiz bay (Spain) were there. I had previously the Daisy 1 which also performs very well. On the boat I will fit the Daisy 1 as the power consumption is so low.... although Daisy 2+ is low power consumption Daisy 1 is less than half. I dont care very much to have a very long range reception on board, so Daisy 1 is my preferred option for the boat. 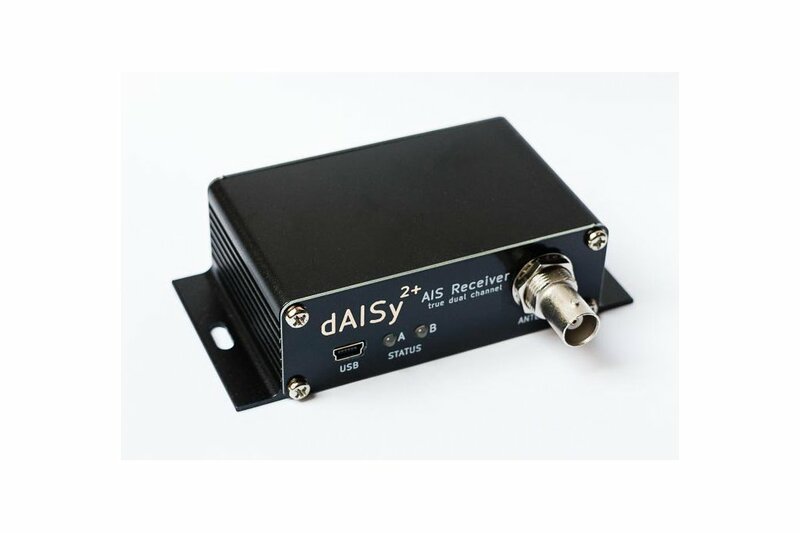 Now I want to connect Daisy 1 to my nmea network so I ordered the RS422 adapter but found is sold!! I will wait for it! Congratulations for so amazing products!! I'm very happy with my purchase of this little guy! Setup was quick and easy, the included instructions are great, the installation didn't break the bank, and I'm pulling in targets from 45 miles away! I'm navigating my small (28') power boat on the Columbia river using the Open Captain software on my laptop. If you are planning on interfacing this AIS receiver with Open Captain, it couldn't be easier: A well written, and well illustrated procedure in the manual drives you through the process step by step. Again setup for using this DT-06 module couldn't have been easier as the dAISy 2+ owners manual contains a a very thorough and complete treatment here as well. I did a bit of pre-wiring of the three components together at home. I also pre-setup all the components using a 12V bench supply to power the various pieces. I spent an hour tops with all my pre-wiring and setup chores! On the boat it was 5 minutes of plugging cables, adding a fuse to my panel, and I was then up and running. 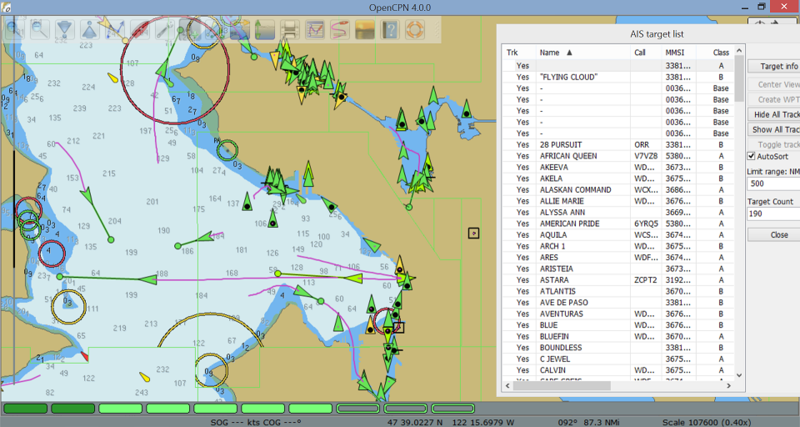 Bringing up Open Captain on my laptop I was seeing all of my AIS targets on screen: No futzing around, it just worked! And as I said, I was pulling in targets from 45 miles away. If you are moderately handy with tools, and have a bit more than a very basic familiarity with computers, then getting the system working will be a total no brainer for you! Total cost of the installation for me was just $130 (as I got a very good real on the RA201). I can't recommend this product strongly enough! One caveat: There are AIS repeaters along the Columbia river, so the 45 miles of range may not be representative for different locations. The dAISy2 is a nicely done product; the packaging, hardware, and software are all thoughtfully constructed. Highly recommended. It's amazing. Amazing that something this small and inexpensive could work this well. Dropped it into our on-board system - wired it to the NMEA wifi router and bingo: AIS targets on all displays. We added a VHF antenna to the stern rail and using just that we were able to see targets as far as 46 miles away. Not even sure how we did that. It worked out very well in the fog in the middle of Lake Superior where we had advance notice of freighters near our course. And in the middle of the night we were able to determine that we needed to tack away to stay safety away from the path of another freighter. It couldn't have been easier to install and use. The only difficult part was crawling around below decks to run the dedicated antenna cable. Just plugged it in and connected the antenna and it worked fine. Easy to use with open cpn. If you want AIS on your big screen computer this is a good way to go. It can feed most popular navigation programs, Customer service is awesome, fast responses to questions. No bots here. The product is this, what i want. It's works out of the box very well und I received ships 8 miles away in a town with no free view. I like! Received item, added antenna, connected to USB interface on laptop, configured to work with OpenCPN. Works very well. Device is currently being used with a MACAIR laptop with latest generation OS and patches. No issues encountered. Directions had exact procedures for setting up. The Daisy was easy to set connect to the multiplexer in my NMEA 0183 system and picks up and tracks targets 10-15 miles away. I am sure that I could get more distance if my antenna was at the top of my mast as opposed to deck level. It also worked great connecting to my computer using USB and Open CPN. Works great! Plug and play! Connected it up to my Garmin 721xs chartplotter, Works instantly providing AIS-data. No configuration needed. The product is really easy to install and at good price. I think that I received what I paid for. All the necessary documentation was sent with the device and also via email. Thank you and all the best.